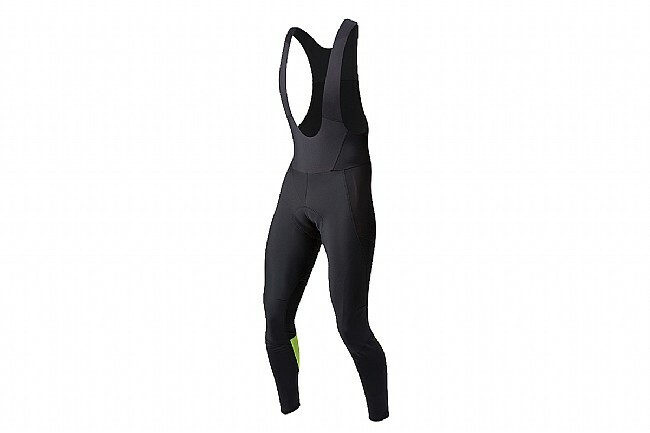 Pearl Izumi's Men's Elite Escape AmFIB Cycling Bib Tight will conquer even the wettest storms Mother Nature can throw at you, encouraging you to venture out into even the sloppiest winter weather. This bibbed version of Pearl's warmest winter tight is constructed from a blend of AmFIB® softshell fabric located in key exposure-areas that blocks wind and water, while ELITE Thermal Fleece back panels provide excellent insulation and breathability, finished with PI Dry™ tech for water-shedding confidence. Up top, bib straps constructed from P.R.O. 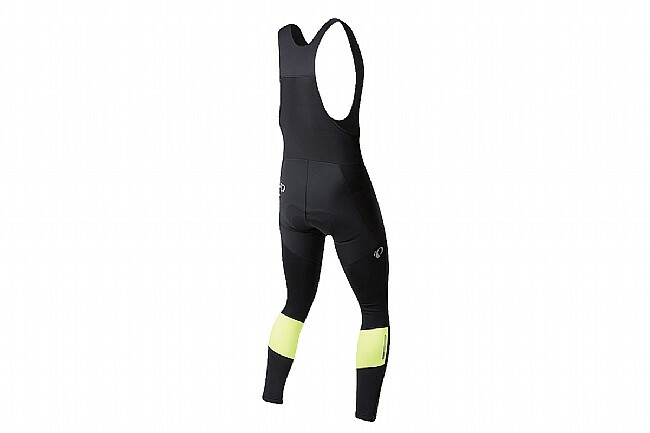 Transfer fabric with raw edge construction keep the tights from shifting during your ride. At the ankles, replacing the sometimes comfortable, sometimes infuriating internal stirrups, the new Elite Escape features a long ankle zipper for easy on and off that lets you seal out road spray. Inside the warm, dry AmFIB you'll find Pearl's ELITE Escape 1:1™ Chamois, providing cloudlike comfort with its floating topsheet and multi-density foam that move with you throughout your pedal stroke for friction free support. The Elite Escape AmFIB is available in four different versions. With the chamois and the bib straps, without the chamois but with bib straps, with the chamois but without the bib straps, or without the chamois or the bib straps. Elite AmFIB™ Softshell fabric provides superior wind and water protection. Thermal Fleece fabric treated with PI Dry™ tech sheds water for a dry ride. Ankle zippers provide for easy on and off. P.R.O. Transfer fabric with raw edge construction on bib uppers for comfort. Single flat pocket for storing easy access to essentials. Elite Escape 1:1™ Chamois for superior comfort. BioViz reflective accents increase low-light visibility for passing motorists, cyclists, or pedestrians. Chest 35"-37½" 37½"-40½" 40½"-43½" 43½"-46½" 46½"-49"
Waist 29"-31½" 31½"-34½" 34½"-37½" 37½"-41½" 41½"-45"
Hips 35"-37½" 37½"-40½" 40½"-43½" 43½"-46½" 46½"-49"
Inseam 31½" 32" 32½" 33" 33½"
Pearl Izumi is my go-to bib brand. Fits true to (American) size, holds up well to cycling and laundry abuse, and feels good on longer days in the saddle. I have worn these in temps from hi 20s to mid 40s with no problems. I've never really had them out in the wet so I can't comment on the waterproofing. I found the shell of the bib excellent in keeping the cold and moisture out! Good warmth, great comfort, reasonable water repellancy. Several of the threads have unraveled so several seams about to let go - shoddy construction. Fit according to the size chart. These bibs are plenty warm. Rode below 40 and was more comfortable than in regular tights. I love these bibs! One of the things I don't like about cold wet weather is the amount of layers I have to wear. With theses one was enough and not only did they keep me completely dry but they kept me warm as well. Best part is that they do so without being bulky or bunching up. They fit correctly and are warm enough. They fit according to the male size chart. They are warmer than lighter weight tights. Rode in below 40 degree weather and they kept my legs warm enough and block wind. These do exactly what they promise, in temperatures below 35 your legs will not be bothered by cold at all. 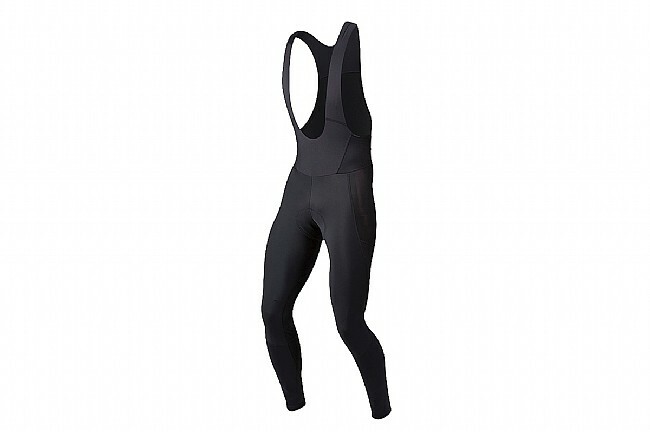 These fit tighter than the midweight thermal bibs and don't stretch quite as much but that's to be expected with the protection they provide and the thickness of the material. They do also seem to restrict my legs slightly when trying to get the cadence above 90 but it's not a really big deal, it's more noticeable when warming up and when the legs start to fatigue. Between all the windproof fabrics and extra weight I'm already much slower than usual anyway so a slight loss of rpms here and there barely registers, it's just fantastic to be able to handle cold conditions. I'm new to Winter riding so I'm not sure if it's normal to chafe more or if the top layer of the chamois is more abrasive than that of my warm weather gear, it may also be the extra thick material bunching up. At any rate I find myself having to apply chamois cream to both my skin and to the pad to avoid some pretty severe irritation. All in all I would recommend these but they don't agree with me quite as well as I had hoped. Sizing chart is accurate. They performed as stated in 40 degree temps. They are comfortable and the paddingChamois is good. They have zippers on the lower legs to help with the on and off. The length is down to the ankles just above the tops of my shoes. I have the ones with the bib straps and the chamois. I haven't had them in the rain yet so I can't tell how water resistant they are. I like how high they come up in the back and the front. I am very happy with the performance of this product. It fits well and looks good.